Like a true press release, I Kings 10 begins with a succinct, one-sentence summary: The Queen of Sheba travels to verify rumors of King Solomon’s success being directly connected to his relationship with his God. It’s the perfect teaser to pique the reader’s interest. Royalty doesn’t go on fact-finding missions; emissaries, agents and ambassadors do that sort of thing. Queens simply don’t take several months to travel some 1500 miles by camelback through unfriendly weather and terrain just to have tea with other royalty. In the courts of Sheba was a fat file on King Solomon. It covered his territory, his wealth, his government, his leadership style, even the number of wives and concubines. Anything quantifiable and verifiable there was of King Solomon, the Queen had a file on it. While she had everything on him, she could not buy into all the media hype about his success coming from God. This was something she had to see for herself. Imagine the benefits to her already wealthy nation if this God-connection was real and she could tap into some of it for her own kingdom. So she arrives with gifts that put all the lobbyists and campaign supporters to shame. From her gifts, her entourage and her beauty, it’s obvious that she’s not looking for favors or services. When the Queen of Sheba surveys the opulence of Israel, the peace among its people, the prosperity in the homes, the wisdom of the King, she sees nothing save the God of King Solomon. She sees a nation where God sits on the throne. She sees a kingdom and a king who give all the credit and glory to God. She witnesses true stewardship–something missing in the Solomon files back home, something she had to experience first-hand. You know your life is one of stewardship when people come to you for who you are or what you do, but find God instead. May you be a portal through which others encounter God. 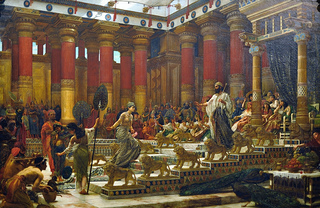 Categories: Weekly Readings | Tags: 1 Kings 10:9, King Solomon, Queen of Sheba, reflecting God | Permalink.